Update: Ben gets 2nd in Big T/B on Hard route behind Mike Husband. Holding a trial in March should mean the worst of the winter weather is not likely to strike but it did on Sunday. The Golden Valley Classic AMCA's annual March Hare trial was a trial in many senses of the word but none the worse for it. Heavy rain at the Hunters Hall start gave way to hail, then snow, so by the time we'd done the first group, we were wiping snow from our goggles. Except those hard men like Andrew Weddle, John Edmonds, Jerry Walters and Paul Tippins who showed what real trials riders are made of, and went sans goggles. Starting near the back of a near 180 field, I was lone ranger for the day, so togged up in all my wet weather gear cracked on with the likes of Jerry, Paul on his lovely twinshock XR500, Mike Husband, Glyn Smith and Max Hawkins, and the Bendall clan throughout the day. Riding the optional hard route, there wasn't really much difference between easy and hard for the first half of trial. Sensibly the club eased most sections and made them no inspection, so it was a case of "point and fire". I even committed the trials sin of riding sections with my goggles on! The tracks between the sections are always brilliant on this trial and the wet weather made them even more fun. Unfortunately Joe Bendall fetched the oil filter cover off the Serow when he decked it on a slippery downhill. I did come a cropper later on in the day on a track with a deep rut which wasn't a trap if crissed crossed quickly. Eventually it caught me out and over the bars I went. Luckily no-one was watching. 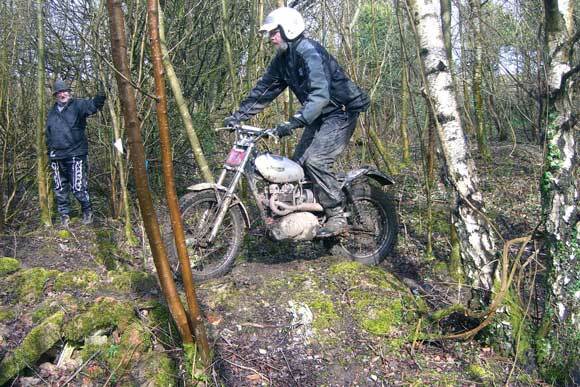 The first really tough section came at Forthay where Stan Howitt was observing. He reckoned only 115 had come through to him, and he was before the halfway point. Dave Harris retired here, suffering from a limp leg. Excellent tea and cakes at Breakheart fired me up and with a following wind, I rolled back in to the finish after 5 1/2 hours of riding. Weather picked up in the afternoon, just in time I would have thought for the Midwest enduro just down the road to finish - I wonder how Gavin and Mike got on there?